Flare Trumpet Pilsner Vase. Color: Black. H-28", Pack of 4 pcs Discounts Apply ! 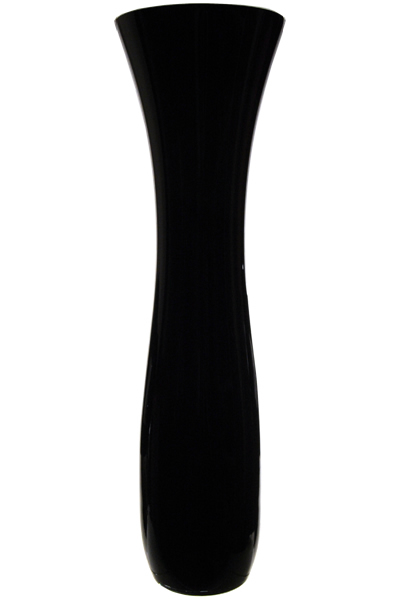 This Flare Trumpet Pilsner Vase is available in rich solid black. The black vase is produced with an inlay process by forming a glob of molten black colored glass as the inner core then dipped into a coat of molten, clear glass on the exterior. Once the molten glass is blown to the designed form, it undergoes a flashing process to ensure proper fusion. Dimension: H-28", Open D - 8"